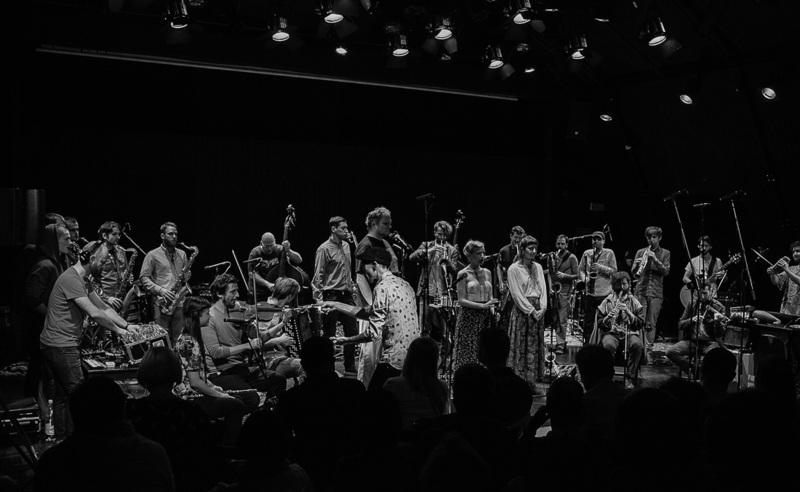 Well on March 14th 2015 as the WIO we finally did the big one, a very large improvising ensemble of 29 musicians. The concert was sold out with people turned away at the door and the room both audience and musicians were heaving with anticipation. We documented the entire concert plus some of the day which we hope to edit an put online soon as a small documentary about the WIO. The concert was also multi track recorded which, from the very rough copy I have heard, sounds amazing. This will take some serious mixing to get the best out of this music which at times was so very dense / heavy and at other times almost translucent in its quality so I want this to shine through the mix. Just Confirmed a 3 date tour (!!) *** in April with great musicians Tim Daisy Drums (US) Ksawery Wójciński Bass (PL) and myself on saxes. Getting such gigs becomes increasingly hard as time goes on, getting such gigs with some form of guarantee - even harder but fortunately this one has fallen into place beautifully. Last year both ksawery and myself played with Tim when he was in Poland playing with Ken Vandermark and such fun was had by all we discussed the possibility of meeting in 2015 to continue our playing relationship. *** Three dates tour (!) the reason for the exclamation marks is the use of the word tour in this context. Well its about time I started this Blog, so here goes. At the end of 2014 with my band "Noise of Wings"
We finally got into the Studio - Polskie Radio Studio S4, a fine acoustic space with great mics, compressors and a beauty of a Neve Desk and recorded our debut album. My concept for this group, which is composition based, is dark ambient, melodic jazz - almost bordering on contemporary classical. We have themes, we improvise but always within strict boundaries . For me it is the quality of sound that is important here, so the smallest breath through the horn becomes part of the natural sound-scape, the scraping of a bow across the bass strings adds texture, the overtones of a cymbal adds harmonic interest. We / I am very happy with the results and hope to secure a release for this soon.